Bacon - Need We Say More? SF Bacon Takedown pits amateur chefs against the pros. 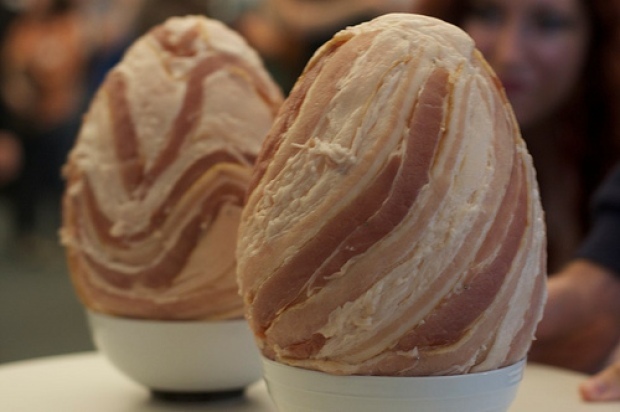 We don't know where it started - or whether it ends in a collective heart attack, but Americans have an obsesson with bacon. You can be the judge. This weekend more than a dozen Bay Area chefs are competing in the San Francisco Bacon Takedown at Thirsty Bear. San Francisco Chronicle Political reporter Marisa Lagos is entering her recipe for bacon ravioli. She's actually a reformed vegetarian who says one day there was a steak she just couldn't pass up. "Ever since I told people I was doing this event, people come out of the woodwork. People love bacon. It's one of those things you're surprised how many people care about." says Lagos. Tom Herndon is a personal chef who says he cooks up bacon every week for people. One client eats it every day. He's cooking up what he calls "Hog Heaven." It's bacon covered in dark chocolate, sour cherry, roasted almond and black pepper. He swears it works together. "Just wait 'til you taste it," says Herndon. The copmetition's host, Matt Timms says it doesn't always matter if the recipe works. "That's the beauty of an event like this," says Timms. There can be some dismal failures and some brilliant successes." For $15, you can find out for yourself Sunday at the Thirsty Bear at noon where only one can take home the top prize. You can also vote for the people's choice. Can't wait that long? 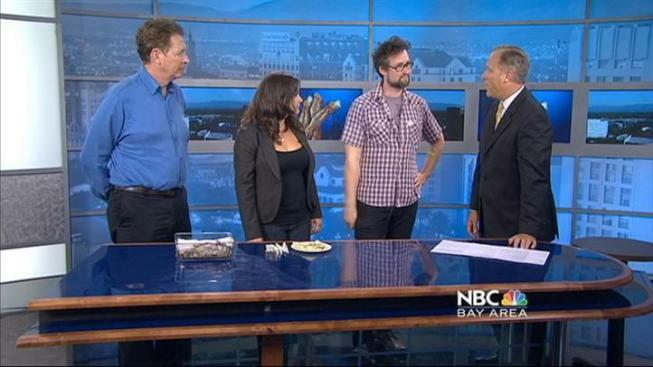 Marisa & Tom shared their Recipes with NBC Bay Area. Sauté half the bacon until slightly crispy and cooked through. Remove from pan and set aside. Chop into thin strips when cooled. Sauté half of the chopped onion with the chopped garlic on low-medium heat for a few minutes. Add the spinach and wilt for a minute. Remove from heat. Mix spinach, ricotta, parmesan, bacon strips, and half of the sage and thyme in bowl. Lay out pasta sheets and place about ½ - 1 tsp. of filling in small mounds an inch apart. Brush water between mounds. Place another sheet on top and press around filling. Use knife or cookie cutter to cut into individual raviolis. Boil a large pot of water with salt. Meanwhile, heat up 2 pans. In one, cook remaining bacon until crispy; remove from heat and crumble. In other pan, heat up olive oil on medium heat. Add 2 smashed garlic cloves and cook for a few minutes, then remove the garlic. Season with salt, pepper and red pepper flakes, then add remaining sage and thyme and immediately remove from heat. Cook ravioli in boiling, salted water for about 2 minutes, being careful not to let them stick together. Remove with slotted spoon and top with oil sauce. Garnish with fresh parsley and crumbled bacon. In small bowl, mix brown sugar and pepper. Lay out the bacon on the foil making sure not to overlap pieced. Cover each slice with the sugar and pepper mix. Sprinkle bacon, almonds and cherries over the chocolate. Gently press everything into the chocolate. Allow to set for 2-3 hours in the fridge. Crack bark into pieces and serve.